Some new and updated QuickTime-related tools have arrived since QuickTime 3.0 released this year. If you use your Macintosh for watching QuickTime movies, listening to audio files, or even creating new movies of any type, QuickTime 3.0 is an easy and useful upgrade. QuickTime 3.0 offers greater flexibility than before, but it will cost you $30 via Apple's Web site for the "Pro" version if you take advantage of new built-in authoring features with MoviePlayer 3.0. If you're more a user than creator of QuickTime, this essential Mac system tool is still free, but you can't create or edit movies with MoviePlayer or save QuickTime files from the Web. You'll need QuickTime Pro for that. I'll take a brief look at a few QuickTime-related tools that have come across my horizon the past few months. This includes Adobe Premiere 5.0, Terran Interactive's Media Cleaner Pro 3.0 compression tool; IXMICRO's ixTV, an inexpensive QuickTime capture card; and three new QuickTime books from PeachPit Press. Premiere started as a simple time-line based program for making small-window QuickTime movies, and has evolved into a tool that professionals and enthusiasts use for making full-screen broadcast-quality movies on videotape. The latest release, Premiere 5.0, tries to solve many of its predecessor's shortcomings, but I've found it still has some stability and speed problems. Premiere 5.0's sleeker on-screen interface presents fewer palettes and windows. It supports Power PC only now, so anyone with a Quadra Mac is out of luck. The look of Premiere is akin to other recent Adobe programs, and if you are comfortable with PhotoShop 4 or 5 or Illustrator 7, learning Premiere's screen layout is easy. As a long time Premiere user, I'm still adapting to the changes. Adobe Premiere 5.0: These windows make up the core of the Premiere 5.0 experience. Source and output windows have been combined into one Monitor window, and a new Navigator window allows easier movements along the Construction window's project timeline. Despite chronic sound-synchronization problems, Premiere 4.2 still gets my preference, and I probably won't migrate fully to 5.0 until we see a bug-fix from Adobe. My systems (both laptop and desktop) have frequently suffered system freezes during Premiere 5.0 launch and editing. The program feels sluggish, even on a PowerMac 9600/350 with lots of RAM. Though Premiere is compatible with QuickTime 3.0, it does not take advantage of any QuickTime 3.0 features except the new Sorenson video codec. 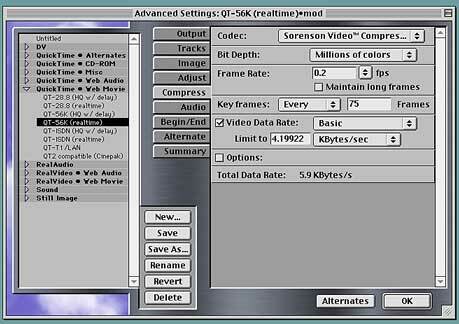 QuickTime 3.0 offers several audio compression options, such as Qualcomm PureVoice, QDesign Music, IMA 4:1 and others, but none are accessible with Premiere 5.0. One can only hope this changes soon. Premiere 5.0's simpler interface reduces screen clutter, but the program still needs under-the-hood tuning before it can compete with the stability of 4.2. Beware that third-party plug-ins such as Artel Software's Boris Effects must be updated to work with Premiere 5.0, and most PCI video capture cards such as Targa and Media 100 need updated drivers to work properly. Check with video capture card manufacturers to see if yours will work at all with Premiere 5.0. Some companies don't plan updated drivers for some cards so they'll work with Premiere 5.0. For example, miro has said no new drivers will be released for the DC-20, and Targa plans no updates for NuBus Targa cards. Premiere 5.0 ships with QuickTime 3.0, and you'll have to pay $30 to upgrade to QuickTime Pro to access authoring features of Apple's MoviePlayer, which is a part of the QuickTime installer. More information is available at Adobe's Web site (http://www.adobe.com). Upgrades from earlier full versions of Premiere cost $199. Media Cleaner Pro is a wonderful piece of software. Its appeal isn't broad, in that its goal is compressing digital movie and picture files in QuickTime or related formats for CD-ROM playback or network delivery via LAN or Web. But what Media Cleaner does it does superbly, and the new Media Cleaner Pro 3.0 presents a more accessible integrated interface. It also supports more media types and compression formats, and has a slicker setup for batch processing of movies of several types at the same time. 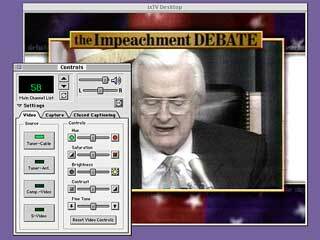 Since Media Cleaner depends on QuickTime to work, much of the added versatility requires QuickTime 3.0. The makers of Media Cleaner, Terran Interactive, have generously included a Pro version of QuickTime 3.0. In addition to QuickTime formats, Media Cleaner now supports Real Audio and Real Video compression, and still picture formats such as JPEG. New QuickTime 3.0 formats such as Sorenson Vision, Qualcomm PureVoice, and QDesign Music are supported with precise customization options. QuickTimeVR compression is not supported right now. Media Cleaner 3.0: This setup window for Media Cleaner Pro shows the many compression options available along the left side. The highlighted options at right show the setup for a movie that would play continuously on your Mac via a 56k-modem connection. Media Cleaner is the leading digital media compression program for the Mac. The manual is exemplary, perhaps the best printed reference available on the basics of digital media compression. Terran's Web site (http://www.terran.com) also hosts an in-depth resource called Codec Central with the latest information on media compression techniques. Street price for Media Cleaner now runs about $350, and upgrades are about $125. If you have a PCI Mac and want to capture video, but have no way to get video from tape to disk, take a look at IXMICRO'Ss new ixTV card (http://www.ixmicro.com). It used to be called Turbo TV and is the same PCI card, only software has changed. ixTV sells for about $110, and lets you watch TV on your Mac's monitor via a built-in 125-channel cable-ready tuner. The card can also capture video via built-in RCA composite video and S-Video inputs, but does not have output ability, so you cannot send movies back out to videotape. The new software for ixTV is fully configurable under QuickTime. This means you can select frame rate, frame size, color depth, image quality, and destination disk for captured files. ixTV also offers a freeze-frame capture option, so you can grab still frames to disk from an incoming video. ixTV also supports closed-captioning from incoming TV signals, but every time I have enabled this feature my Mac has eventually frozen and required restarting. TV on the Desktop: IXMICROS's new ixTV card allows you to watch TV on your Mac. This shows the 125-channel main tuner and setup window, which allows customization of incoming signals. ixTV also allows you to grab freeze frames to disk. ixTV isn't designed for high-end video capture and editing. Its basic purpose is so you can watch broadcast TV on your desktop. It also offers several options that make it a useful tool for those who want to get video source material into their Macs, but don't have factory-supplied video capture cards. PeachPit Press has released a new Visual QuickStart Guide dealing with QuickTime. It's called QuickTime and MoviePlayer Pro 3.0: For Windows and Macintosh and is the only printed book on the market for MoviePlayer. Apple itself prints none, the only instructions for MoviePlayer are electronic via their website (http://www.apple.com/quicktime/). By Robert Stern and Judith Lettieri, this $18 book comes from the folks who produced the electronic documentation for MoviePlayer at Apple's Web site. At 192-pages, the book covers all aspects of QuickTime 3.0's feature set, and in the tradition of Visual QuickStart Guides, uses graphics and screen shots to walk you through the available tools and methods built into MoviePlayer Pro. Stern and Lettieri host an informative Web page updated weekly that deals with QuickTime topics (http://www.bmug.org/quicktime). It's not released as of this October writing, but Michael Feerer's Premiere 5 With a Passion: The Essential Guide to Video Editing, Effects and Production with Adobe Premiere should continue in the enthusiastic tradition of previous editions. Feerer's engaging style makes the book a useful and enjoyable reference to use. Look for this $45 book and CD-ROM combo at bookstores near the end of the year. 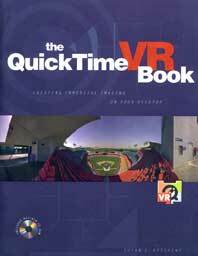 PeachPit Titles: The QuickTimeVR book is one of three new QuickTime titles from PeachPit Press. Other new titles deal with QuickTime 3 and MoviePlayer Pro, and Adobe Premiere 5.0. If you are into Apple's panoramic and 3D object "movie" technology called QuickTimeVR (virtual reality), PeachPit Press also has a book for you. The QuickTimeVR Book: Creative Immersive Images on Your Desktop, provides a thorough overview of Apple's VR and 3D tools and is an impressive reference in itself on basics of QuickTime compression. Written by Susan Kitchens, who also wrote a PeachPit book on MetaCreations' popular Bryce 3D program, the book comes with a CD full of QuickTime VR movies. The package lists for $40. The Pi was six years old when Dennis Dimick got his first computer, an Apple IIc with 128kb of RAM. It cost the same as an iMac., And didn't come with a monitor. A Pi short-timer, (Member #14662) Dennis Dimick joined only eight years ago, about the time he got his first Macintosh. It was an SE with two floppy drives and cost more than a PowerMac G3 does today. A resident of Arlington, VA, he can be reached via email: ddimick@aol.com.